GSMArena team, 16 August 2016. 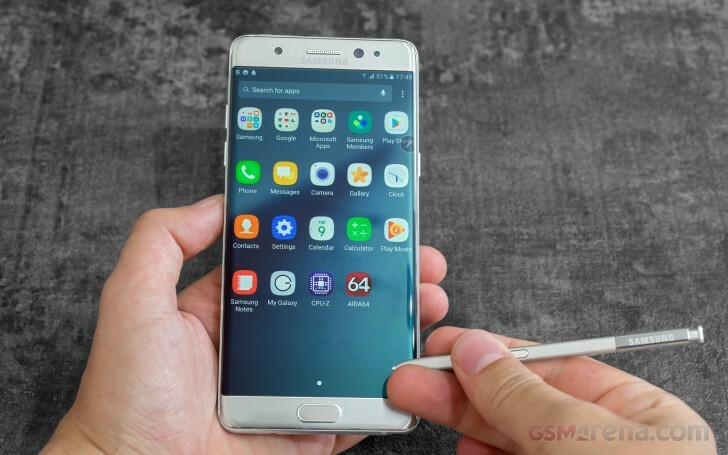 The Samsung Galaxy Note7 runs a TouchWiz-skinned Android 6.0.1 Marshmallow. An update to v7.0 Nougat is already planned, but it should take a few months. The fingerprint reader used on the Note7 is the same as the one on the Galaxy S7. It recognizes a finger in under a second - very fast, though not the fastest we've seen. All it takes to unlock the phone is to press the Home key and leave your finger for a moment longer while the fingerprint reader does its thing. Then there's the iris scanner too, when you get used to it, it can be as fast as the fingerprint reader. The Galaxy Note7 brings some changes to the TouchWiz interface, but it's a collection of minor tweaks rather than a major redesign. Depending on where you are in the world, your leftmost homescreen would be either the Flipboard-powered Briefing or Upday (this is the one we got on our international unit). The two do pretty much the same thing - they aggregate news according to a pre-defined list of interests. The Notification area has a revamped layout. The screen brightness slider is no longer visible on the first swipe. Instead, it has been moved next to the quick toggles. Also here is a new search field. This isn't Google Now's search, instead, it searches for local files and apps as well as nearby devices for wireless connectivity. The Galaxy Note7 user interface is fully themeable. We only got one theme pre-installed, but the Theme Store has more for you to download. By the way, there is an option to disable the app drawer, so you may want to give it a try. Split-screen multitasking is supported on the Note7, and the 5.7" screen was born to do it. Even at half a screen, apps get plenty of room (Material design likes a lot of padding though). As always, only supported apps can work in split-screen (you'll recognize them by a button in the app switcher, next to the X). Also, Samsung's implementation is the most widely supported. Floating app windows are supported for some apps, too. The precision allowed by the S Pen's tip (compared to your finger) makers using apps even in this downscaled state a breeze. Some hover features are a great help too, like hovering near the edge of an app scrolls its window in that direction (great for using a minimized web browser). Some cool gestures are available for the Galaxy Note7 - you can flip the phone for mute, swipe your palm for screenshot, double-tap the Home key for quick camera access, quick call, among others. Our international Samsung Galaxy Note7 comes free of bloatware, but has a few Microsoft apps pre-installed (MS Office, OneDrive with 100GB for 2-years, Skype). You can disable them, but not completely delete them. The US model we received (T-Mobile) had a few extra carrier-specific apps and also Amazon's mobile app preinstalled.